Direct Link is a FastBooking exclusive and a worldwide innovation for independent hotels and independent hotel groups. A single click on the ‘check rates’ button brings Internet users from worldwide partner sites to a special page on the official hotel website displaying the results of the web user request from the partner website. 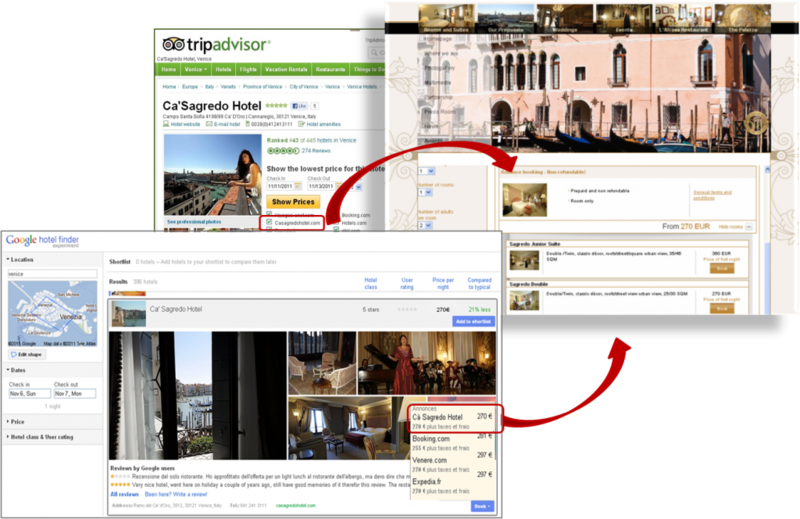 FastBooking Direct Link debuts with Google (Google Maps, Google Hotel Finder), TripAdvisor and Trivago. FastBooking, one of the world’s leading online e-marketing and online technology solutions providers for the hospitality industry, announces its newest service, FastBooking Direct Link. FastBooking Direct Link debuts with long-time travel and price comparison site partners Google (Google Maps, Google Hotel Finder), TripAdvisor and Trivago. The service is scheduled to extend to Kayak and Wego in Q1 2012 and continue to build momentum over the course of the coming year. “Direct Link is completely in line with our key promise: increasing hotel direct bookings,” says Jean Louis Boss, FastBooking Vice President, Marketing. The Direct Link program extends the hotel’s brand visibility to a global customer base with high purchasing power. “FastBooking Direct Link is a first for independent hotels and an opportunity to significantly increase their direct online sales,” says Jean Charles Lacoste, Vice President Account Management, TripAdvisor. Partner websites link to a dedicated landing page on the official hotel website using XML connectivity. This landing page displays the results of the request made by the web user on the partner site. “We estimate that FastBooking Direct Link highlights the official hotel website and the hotel’s availability to a combined total of more than 100 million unique, qualified visitors each month on the partner sites,” continues Jean Louis Boss. FastBooking Direct Link is the newest service available through FastBooking Hotel Traffic Builder, a program featuring customized SEM promotion campaigns to increase hotel visibility and direct online bookings.